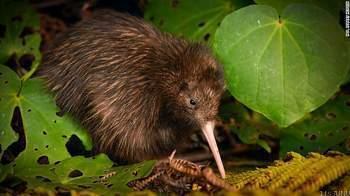 Conservation efforts in New Zealand to save the flightless kiwi bird have paid off, with two species -- the Northern brown and the rowi -- no longer at a high risk of extinction. The latest update to the International Union for Conservation of Nature and Natural Resources' (IUCN) Red List of Threatened Species upgraded the status of the birds from "endangered" to "vulnerable" because of a steady increase in population. "Other kiwi like the great spotted are still in serious trouble," said Kevin Hackwell, chief conservation officer at Forest and Bird, BirdLife International's partner in New Zealand. Jim Reynolds, lecturer in ornithology and animal conservation at the University of Birmingham in England, was cautious in his optimism: "I worry when conservation status is ameliorated to a 'better outcome' because these birds are being re-categorized as being in less trouble-- this will mean people will take their eye off the ball a little bit.